The best thing about animals is the unpredictability associated with their behavior. They can be happy after a very little cuddle from your side and sometimes can’t get out of a miserable mood even after hours of struggle. The same trend of unpredictability is followed during their wandering ventures inside and outside of your house. They never follow a particular pattern and can leave the house without your authorization off course. Dog owners very often come up with the complaints of a runaway or a lost dog, and the reason is the natural behavior of the dogs which is more or less often associated with a particular type or breed. Dogs are indeed mischievous pets, and whenever find a door open they try their best to escape. This is the reason why so many dogs are lost each year, and this is an excruciating experience for most of the dog owners. Sometimes during the renovation, construction or gardening, the noise of working machines scares a dog to the extent that he tries to move away from the center of sound as much as he could. This noisy surrounding result in bringing him to the point of no return, and at the end, he is lost without a clue of his house. Many dog owners have complained their dogs to be running to the old house more than once. Sometimes they ruin the family vacation by traveling all the way home without bringing it to the family’s notice. Dogs usually love their homes a lot and do not like to spend a lot of time away. Sometimes your dog is feeling exhausted and is in dire need of fun. This is the reason he will try to escape from an open door, a small hole in the fence and through the lawn, sewers to relish the outside environment. 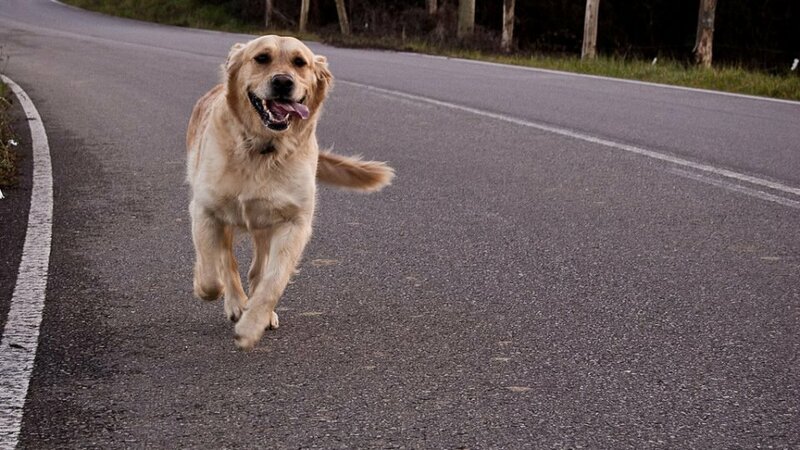 Take a lesson in fun from Walter, the dog who loves to run! The well-known dog GPS collar manufacturing company WHISTLE has recently compiled data from over 150,000 dogs from different regions to find out the association of the runway adventures with a particular breed. As a result of their findings following 15 dog breeds are rendered highly intended to escape from your house at least once in a year. This gorgeous dog is one premium breed, but it always threatens you with its high affinity to the escaping adventure. With 2.13 times per month chances of run away, he will never let his owner be in peace ever. The golden dog can win the hearts of any family but with chances as high as 1.3 times per month of runaway demand a higher level of surveillance over this beautiful hound. The Pyrenean mountain dog or the Great Pyrenees is an adorable white dog very popular in North America. But the owner can have to go through the headache of losing this dog 1.2 times a month. The medium sized breed of the dog also known as “Aussie,” has a probability of getting lost at least 0.9 times per month. This intelligent and loving dog is also the state dog of Louisiana. However, the owner can lose this beautiful dog up to 1.2 times per month. This hardworking and stubborn dog can be lost 1.2 times a month. The Poodle is the most famous and adorable formal dog breed. However, the probability of a poodle escaping from the owner is 0.9 times a month. This dog breed is famous for its large size and leaving its owner for up to 1.2 times per month. These huge and lively dogs can leave their owners 1.2 times a month for irregular outings. This energetic dog can exhaust its owner 0.9 times a month in hectic search of the dominant breed. The best attempt at preventing your dog from escaping and causing you with an immense trouble is the use of dogs GPS collars. These modern gadgets will help you keep track of your dog even at work, and you will be saved from the gruesome experience of searching for your dog in every nearby block ad woods at least once a month.